Not the most eloquent title for a blog post, I admit, but I couldn’t resist. It’s back to the Bard this week, and once you start Henry IV you have to go through Henry V, so I suppose we’ll be reading him for the next three weeks. 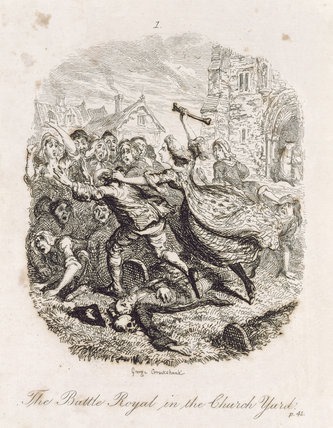 Tom Jones by Henry Fielding, Book IV: The mock-epic telling of the battle in the churchyard is probably one of the funniest things I’ve ever read. I was chuckling when Fielding invoked the Muse and when he employed the Homeric simile likening the post-service crowd to a herd of just-milked cows trying to reach their young. Then I laughed out loud when he asked the Muse to tell who fell at Molly’s hands and started listing the names of villagers. The Eumenides by Aeschylus: Apollo’s defense of Orestes at his trial falls flat from a 21st-century perspective: “Orestes had to avenge his father even if it meant killing his mother. The father is the true parent, and the mother is just a caretaker of the seed. Look at Athena! She didn’t have a mother.” What I found most interesting was the reconciliation between Athena and the Furies after the verdict was rendered. An Inquiry into the Nature and Causes of the Wealth of Nations by Adam Smith, Book IV, Chapters 6-7: Smith throws lots of information about colonies at the reader. The huge expense of defending colonies against hostile foreigners is one big bounty (subsidy) to domestic manufacturers and merchants who want a captive market. This makes no economic sense. I liked the discussion about labor and capital in colonies and how their scarcity makes them so much more valuable there. The Descent of Man by Charles Darwin, Chapter 7: Darwin puzzles at length over the question of whether the different human races should be classified as different species. He admits that any naturalist viewing mankind as he would beasts would be perfectly justified in saying yes. But then he essentially says that all the races are from the same stock, so he prefers to call them all one species. you may remember that Darwin never really gave an acceptable (to me) definition of “species” back in Origin of Species, so I think it’s fair to ask for more from him here. If all life is from the same stock, why isn’t everything the same species? An Essay Concerning Human Understanding by John Locke, Book IV, Chapters 5-8: I’m getting more and more uncomfortable with Locke as we proceed. Now he’s saying the Truth is simply the joining or separating of signs (ideas or words). Yes, he adds that this joining or separating is “as the Things signified by them do agree or disagree one with another,” but come on. I’m not sure I followed the discussion on maxims as well as I would have liked. I may have to revisit that at some point. I’m pleased to announce the arrival of my sixth son, who joined us five days late last Saturday morning. The intervening time, of course, has been rather hectic, so I hope you all will be understanding at my failure to make this week’s Great Books post before Saturday. Big congrats on the addition!